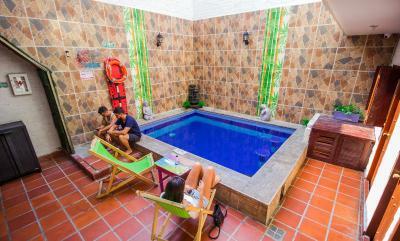 Lock in a great price for El Hostal de Jackie – rated 8.6 by recent guests! The staff are very lovely and kind. Spent one night here and became friends with most of them. The rooftop is awesome to hangout, and the wifi is great too. Location! I love where is located pretty close to the downtown, and others important places. The location was great - right next to Parque de Los novios - and the price for a private double couldn't be beat. AC worked really well and so did the wifi. The staff was extremely nice and helpful. We only stayed here one night for a quick stay after Parque Tayrona before our flight out and would recommend to anyone looking for a similar set up. Rory was really friendly and welcoming. It was a central location and they stored my bag for free. Staff was great, everybody has a good attitude and always has one smile for you. Each bed had its own fan, which made sleeping there bearable. The pool is small but nice. The staff was very friendly and helpful in booking tours. nice hostel with a chill pool and delicious breakfast. my single room was clean and comfy. location is quiet but like one minute walk to the bars/restaurants - perfect. 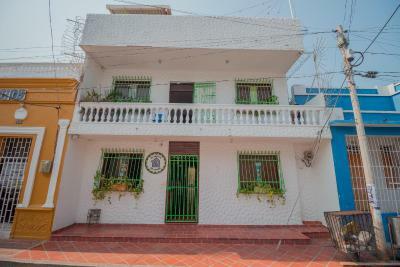 Located in Santa Marta historic center, 650 feet from the bay, El Hostal de Jackie features an indoor swimming pool, a fully equipped common kitchen, and a common TV room. 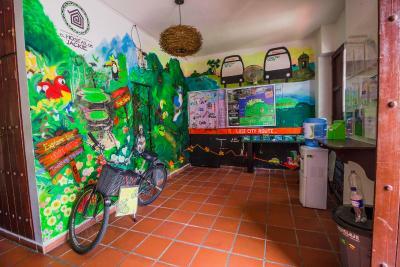 Rooms at El Hostal de Jackie feature either private or shared bathroom facilities. Room service is available. Breakfast is served daily with eggs, "arepas", bread, and butter. Guests can order snacks and drinks at the terrace bar. Free WiFi is available in public areas. 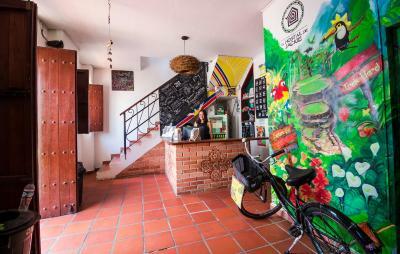 Jackie's Hostel is a 30-minute drive from Simón Bolívar International Airport. 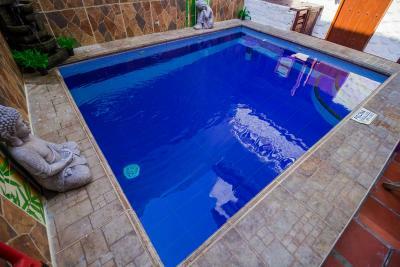 This property also has one of the top-rated locations in Santa Marta! Guests are happier about it compared to other properties in the area. 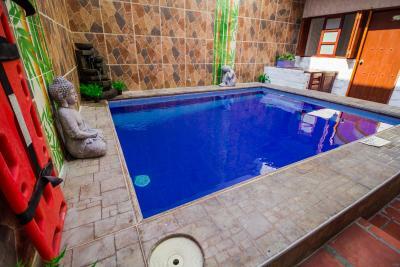 뀐 Located in the real heart of Santa Marta, this property has an excellent location score of 9.3! When would you like to stay at El Hostal de Jackie? Single bed in a 10-bed dormitory room featuring individual fans and inner shared bathroom. This bed in dormitory features a dining area and air conditioning. House Rules El Hostal de Jackie takes special requests – add in the next step! El Hostal de Jackie accepts these cards and reserves the right to temporarily hold an amount prior to arrival. Everything was how I expected it, nothing to complain about. The staff was lovely! 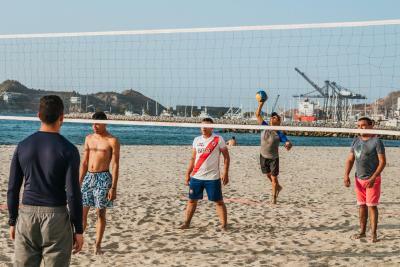 Good location in the city center close to the beach. Good breakfast. The kitchen was dirty. The rooms were unbelievably hot, and we were not told we didn’t have air con and ended up having to ask for another fan due to being unable to sleep. The hostel was really nice, the staff were friendly and really helpful. The pool was clean. It is a great place!! I wanted to stay only 2 days and i stayed 6 days. The staff is so friendly and helpful. You ll feel like in your home. There is a restaurant and bar on the rooftop!!! Stuff was trying to sell taxis but that's the job right. They where confused with the beds and at late night some one sleep in my bed, I needed to move to another bed, what was okay but the sheets from the other bed did got changed. Construction on the pool started when I left. Kitchen don't have any salt or oil. One of our locker was brocken so one of us could not use a locker, stuff did not care much about. Rooms are big we had a private bathroom. Locker a big, not big enough for a backpack but enough to chare if one is broken. Breakfast is big. Hammocks to chill out. Central. No light on your bed but own shelf and charg possiblity. Fan is good but very laut. It was noisy. The music in the bar was loud enough to hear down the street. They also allow children and there were screaming babies both early in the morning and late at night. That place is very nice, very colourful where you can chill on the huge rooftop with drinks and/or food but also in any hamacs you’ll find around. The pool is big enough and clean also ! There is a kitchen if you feel like cooking. They have many tours available at the reception but they also do laundry. The staff is lovely they all speak English and have activities during the day. I definitely recommend hostal de Jackie for its facilities, staff and price ! the staff is really friendly there. the pool is relaxing and the breakfast is good for the price its really good!! Pool was under construction - wished they would have told us sooner. Good WiFi and friendly staff. Juice for breakfast tasted horrible. Annoying to wait for a staff member to let you in and out of the hostel. We waited for 15 minutes in the heat with our bags while she checked in others. Very slow check in procedure..... Not enough lockers. Staff very friendly and helpful. Good tour desk. Breakfast very nice. Good kitchen facilities. Nice rooftop bar.